Tony La Russa managed the Cardinals from 1996–2011. Tip O'Neill won the first batting Triple Crown in franchise history in 1887. Albert Pujols batted .328 with 445 home runs in 11 seasons as a Cardinal. Johnny Mize won the 1939 batting title and hit .336 with a .600 slugging percentage as a Cardinal. Lou Brock ranks second in franchise history in multiple career batting categories. 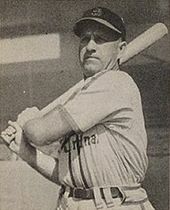 Enos Slaughter ranks in the top five in multiple career batting categories. Note: 1,500 plate appearances (PA) required for rate statistics. Dave Foutz ranks third in franchise history in ERA and fourth in winning percentage (first for all with 100+ decisions). Jesse Haines ranks second in franchise history in wins, innings and complete games. 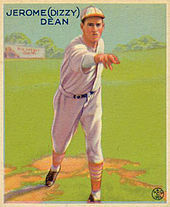 Dizzy Dean ranks third in team history in strikeouts and fifth in shutouts. Adam Wainwright ranks second in franchise history in strikeouts, strikeouts per nine innings pitched and strikeout-to-walk ratio. Notes: 500 innings pitched (IP) and 50 decisions qualify for career rate statistics. Mark McGwire leads in four categories and is second in six. Notes: 100 IP and 10 decisions qualify for rate statistics. Note: Minimum 250 plate appearances (PA) for rate statistics for seasons 1882–91. From 1892–present, the minimum number of PA is 300. Minimum 16 stolen base attempts qualifies for stolen base percentage. Since 1951 only. Includes both regular season and postseason games. **George Harper, Mark McGwire (3×), Johnny Mize (4×), Stan Musial (2×), Albert Pujols (4×), Reggie Smith, George Watkins, Paul Goldschmidt, and Bill White. Pitchers with nine SO in a postseason game: Andy Benes, Paul Derringer, Gibson (2×), Michael Wacha, Wainwright, Jeff Weaver, and Woody Williams. 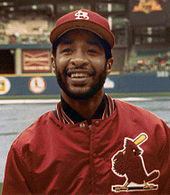 Ozzie Smith holds numerous career fielding records for Cardinals shortstops. Red Schoendienst leads Cardinals second basemen in three career categories. Ken Boyer leads Cardinals third basemen in four career categories. Jim Bottomley leads Cardinals first basemen in putouts and games played and is second in double plays. Curt Flood ranks first among Cardinal outfielders in putouts and fourth in double plays and games played. Note: 2,000 innings minimum for position players' fielding percentage; 500 innings for pitchers. St. Louis Cardinals top 10 batting leaders. Baseball-Reference.com. Retrieved November 8, 2013. St. Louis Cardinals top 10 pitching leaders. Baseball-Reference.com. Retrieved November 8, 2013. ^ "St. Louis Cardinals team history & encyclopedia". Baseball-Reference.com. Retrieved November 8, 2013. ^ "St. Louis Cardinals top 10 batting leaders". Baseball-Reference.com. Retrieved November 8, 2013. ^ "St. Louis Cardinals top 10 pitching leaders". Baseball-Reference.com. Retrieved November 8, 2013. ^ a b "St. Louis Cardinals managers". Baseball-Reference.com. Retrieved July 26, 2017. ^ "from 1916 to 2013, playing for STL, sorted by greatest runs scored". Baseball-Reference.com. Retrieved January 5, 2014. ^ "from 1916 to 2013, playing for STL, sorted by greatest hits". Baseball-Reference.com. Retrieved January 11, 2014. ^ "from 1916 to 2013, playing for STL, sorted by greatest home runs". Baseball-Reference.com. Retrieved January 5, 2014. ^ "from 1916 to 2013, playing for STL, sorted by greatest SO". Baseball-Reference.com. Retrieved January 19, 2014. ^ a b "St. Louis Cardinals team history & encyclopedia". Baseball-Reference.com. Retrieved February 14, 2014. ^ a b c d e "St. Louis Cardinals Team History & Encyclopedia". Baseball-reference.com. Retrieved May 4, 2018. ^ "St. Louis Cardinals team stats »» 2013 »» batters »» dashboard, batting average". Fangraphs Baseball. Retrieved February 14, 2014. ^ "St. Louis Cardinals team stats »» 2013 »» batters »» dashboard, runs scored". Fangraphs Baseball. Retrieved February 14, 2014. ^ "St. Louis Cardinals team stats »» 2013 »» batters »» dashboard, hits". Fangraphs Baseball. Retrieved February 14, 2014. ^ "St. Louis Cardinals team stats »» 2013 »» batters »» dashboard, doubles". Fangraphs Baseball. Retrieved February 14, 2014. ^ "St. Louis Cardinals team stats »» 2013 »» batters »» dashboard, triples". Fangraphs Baseball. Retrieved February 14, 2014. ^ "St. Louis Cardinals team stats »» 2013 »» batters »» dashboard, home runs". Fangraphs Baseball. Retrieved February 14, 2014. ^ "St. Louis Cardinals team stats »» 2013 »» batters »» dashboard, strikeouts". Fangraphs Baseball. Retrieved February 14, 2014. ^ "St. Louis Cardinals team stats »» 2013 »» batters »» dashboard, stolen bases". Fangraphs Baseball. Retrieved February 14, 2014. ^ a b "St. Louis Cardinals team yearly pitching stats". Baseball-Reference.com. Retrieved February 15, 2014. ^ "Tip O'Neill statistics and history". Baseball-Reference.com. Retrieved February 17, 2014. ^ "Albert Pujols statistics and history". Baseball-Reference.com. Retrieved February 17, 2014. ^ "Johnny Mize statistics and history". Baseball-Reference.com. Retrieved February 17, 2014. ^ "Single seasons, Playing for the STL, from 1882 to 1891, (requiring at least 250 plate appearances), sorted by greatest batting average". Baseball-Reference.com. Retrieved December 30, 2013. ^ "Single seasons, Playing for the STL, from 1882 to 1891, (requiring at least 250 plate appearances), sorted by greatest on-base %". Baseball-Reference.com. Retrieved December 30, 2013. ^ "Single seasons, Playing for the STL, from 1882 to 1891, (requiring at least 250 plate appearances), sorted by greatest slugging %". Baseball-Reference.com. Retrieved December 30, 2013. ^ "Single seasons, Playing for the STL, from 1882 to 1891, (requiring at least 250 plate appearances), sorted by greatest on-base plus slugging". Baseball-Reference.com. Retrieved December 30, 2013. ^ "Single seasons, Playing for the STL, from 1882 to 1891, (requiring at least 250 plate appearances), sorted by greatest adjusted OPS+". Baseball-Reference.com. Retrieved December 30, 2013. ^ "Single seasons, Playing for the STL, from 1882 to 1891, sorted by greatest games played". Baseball-Reference.com. Retrieved December 30, 2013. ^ "Single seasons, Playing for the STL, from 1882 to 1891, (requiring at least 250 plate appearances), sorted by greatest plate appearances". Baseball-Reference.com. Retrieved December 30, 2013. ^ "Single seasons, playing for the STL, from 1882 to 1891, sorted by greatest at bats". Baseball-Reference.com. Retrieved December 30, 2013. ^ "Single seasons, playing for the STL, from 1882 to 1891, sorted by greatest runs scored". Baseball-Reference.com. Retrieved December 30, 2013. ^ "Single seasons, playing for the STL, from 1882 to 1891, sorted by greatest hits". Baseball-Reference.com. Retrieved January 4, 2014. ^ "Single seasons, playing for the STL, from 1882 to 1891, sorted by greatest total bases". Baseball-Reference.com. Retrieved January 4, 2014. ^ "Single seasons, playing for the STL, from 1882 to 1891, sorted by greatest doubles". Baseball-Reference.com. Retrieved January 4, 2014. ^ "Single seasons, playing for the STL, from 1882 to 1891, sorted by greatest triples". Baseball-Reference.com. Retrieved January 4, 2014. ^ "Single seasons, playing for the STL, from 1882 to 1891, sorted by greatest home runs". Baseball-Reference.com. Retrieved December 30, 2013. ^ "Single seasons, playing for the STL, from 1882 to 1891, sorted by greatest runs batted in". Baseball-Reference.com. Retrieved January 4, 2014. ^ "Single seasons, playing for the STL, from 1882 to 1891, sorted by greatest bases on balls". Baseball-Reference.com. Retrieved January 4, 2014. ^ "Single seasons, playing for the STL, from 1882 to 1891, sorted by greatest strikeouts". Baseball-Reference.com. Retrieved January 4, 2014. ^ "Single seasons, playing for the STL, from 1882 to 1891, sorted by greatest stolen bases". Baseball-Reference.com. Retrieved January 4, 2014. ^ "Single seasons, playing for the STL, from 1882 to 1891, sorted by greatest runs created". Baseball-Reference.com. Retrieved January 4, 2014. ^ "Single seasons, playing for the STL, from 1882 to 1891, sorted by greatest extra base hits". Baseball-Reference.com. Retrieved January 4, 2014. ^ "Single seasons, playing for the STL, from 1882 to 1891, sorted by greatest times on base with ROE". Baseball-Reference.com. Retrieved January 4, 2014. ^ "Single seasons, playing for the STL, from 1882 to 1891, sorted by greatest hit by pitch". Baseball-Reference.com. Retrieved January 4, 2014. ^ "Single seasons, playing for the STL, from 1882 to 1891, sorted by greatest AB per SO". Baseball-Reference.com. Retrieved January 4, 2014. ^ "Single seasons, playing for the STL, from 1882 to 1891, sorted by greatest outs". Baseball-Reference.com. Retrieved January 4, 2014. ^ "Single seasons, playing for the STL, from 1892 to 1920, (requiring at least 300 plate appearances), sorted by greatest batting average". Baseball-Reference.com. Retrieved January 2, 2014. ^ "Single seasons, playing for the STL, from 1892 to 1920, (requiring at least 300 plate appearances), sorted by greatest on-base %". Baseball-Reference.com. Retrieved January 7, 2014. ^ "Single seasons, playing for the STL, from 1892 to 1920, (requiring at least 300 plate appearances), sorted by greatest slugging %". Baseball-Reference.com. Retrieved January 2, 2014. ^ "Single seasons, playing for the STL, from 1892 to 1920, (requiring at least 300 plate appearances), sorted by greatest on-base plus slugging". Baseball-Reference.com. Retrieved January 7, 2014. ^ "Single seasons, playing for the STL, from 1892 to 1920, (requiring at least 300 plate appearances), sorted by greatest adjusted OPS+". Baseball-Reference.com. Retrieved January 2, 2014. ^ "Single seasons, playing for the STL, from 1892 to 1920, sorted by greatest games played". Baseball-Reference.com. Retrieved January 7, 2014. ^ "Single seasons, playing for the STL, from 1892 to 1920, sorted by greatest plate appearances". Baseball-Reference.com. Retrieved January 7, 2014. ^ "Single seasons, playing for the STL, from 1892 to 1920, sorted by greatest at bats". Baseball-Reference.com. Retrieved January 7, 2014. ^ "Single seasons, playing for the STL, from 1892 to 1920, sorted by greatest runs". Baseball-Reference.com. Retrieved January 8, 2014. ^ "Single seasons, playing for the STL, from 1892 to 1920, sorted by greatest hits". Baseball-Reference.com. Retrieved January 8, 2014. ^ "Single seasons, playing for the STL, from 1892 to 1920, sorted by greatest total bases". Baseball-Reference.com. Retrieved March 18, 2015. ^ "Single seasons, playing for the STL, from 1892 to 1920, sorted by greatest doubles". Baseball-Reference.com. Retrieved March 20, 2015. ^ "Single seasons, playing for the STL, from 1892 to 1920, sorted by greatest triples". Baseball-Reference.com. Retrieved March 18, 2015. ^ "Single seasons, playing for the STL, from 1892 to 1920, sorted by greatest home runs". Baseball-Reference.com. Retrieved January 2, 2014. ^ "Single seasons, playing for the STL, from 1892 to 1920, sorted by greatest runs batted in". Baseball-Reference.com. Retrieved January 2, 2014. ^ "Single seasons, playing for the STL, from 1892 to 1920, sorted by greatest bases on balls". Baseball-Reference.com. Retrieved March 20, 2015. ^ "Single seasons, playing for the STL, from 1892 to 1920, sorted by greatest strikeouts". Baseball-Reference.com. Retrieved March 20, 2015. ^ "Single seasons, playing for the STL, from 1892 to 1920, sorted by greatest stolen bases". Baseball-Reference.com. Retrieved March 21, 2015. ^ "Single seasons, playing for the STL, from 1892 to 1920, sorted by greatest runs created". Baseball-Reference.com. Retrieved March 21, 2015. ^ "Single seasons, playing for the STL, from 1892 to 1920, sorted by greatest extra base hits". Baseball-Reference.com. Retrieved March 21, 2015. ^ "Single seasons, playing for the STL, from 1892 to 1920, sorted by greatest times on base with ROE". Baseball-Reference.com. Retrieved March 21, 2015. ^ "Single seasons, playing for the STL, from 1892 to 1920, sorted by greatest times on hit by pitch". Baseball-Reference.com. Retrieved March 21, 2015. ^ "Single seasons, playing for the STL, from 1892 to 1920, sorted by greatest sacrifice hits". Baseball-Reference.com. Retrieved March 29, 2015. ^ "Single seasons, playing for the STL, from 1892 to 1920, sorted by greatest AB per SO". Baseball-Reference.com. Retrieved March 29, 2015. ^ "Single seasons, playing for the STL, from 1892 to 1920, sorted by greatest outs". Baseball-Reference.com. Retrieved March 30, 2015. ^ "Single seasons, playing for the STL, from 1921 to 1968, (requiring at least 300 plate appearances), sorted by greatest batting average". Baseball-Reference.com. Retrieved January 1, 2014. ^ "Single seasons, playing for the STL, from 1921 to 1968, (requiring at least 300 plate appearances), sorted by greatest on-base %". Baseball-Reference.com. Retrieved January 1, 2014. ^ "Single seasons, playing for the STL, from 1921 to 1968, (requiring at least 300 plate appearances), sorted by greatest slugging percentage". Baseball-Reference.com. Retrieved January 1, 2014. ^ "Single seasons, playing for the STL, from 1921 to 1968, (requiring at least 300 plate appearances), sorted by greatest on-base plus slugging". Baseball-Reference.com. Retrieved April 6, 2014. ^ "Single seasons, playing for the STL, from 1921 to 1968, (requiring at least 300 plate appearances), sorted by greatest adjusted OPS+". Baseball-Reference.com. Retrieved April 6, 2014. ^ "Single seasons, playing for the STL, from 1921 to 1968, sorted by greatest games played". Baseball-Reference.com. Retrieved January 1, 2014. ^ "Single seasons, playing for the STL, from 1921 to 1968, sorted by greatest plate appearances". Baseball-Reference.com. Retrieved April 6, 2014. ^ "Single seasons, playing for the STL, from 1921 to 1968, sorted by greatest at bats". Baseball-Reference.com. Retrieved April 6, 2014. ^ "Single seasons, playing for the STL, from 1921 to 1968, sorted by greatest runs scored". Baseball-Reference.com. Retrieved April 6, 2014. ^ "Single seasons, playing for the STL, from 1921 to 1968, sorted by greatest hits". Baseball-Reference.com. Retrieved April 6, 2014. ^ "Single seasons, playing for the STL, from 1921 to 1968, sorted by greatest total bases". Baseball-Reference.com. Retrieved April 6, 2014. ^ "Single seasons, playing for the STL, from 1921 to 1968, sorted by greatest doubles". Baseball-Reference.com. Retrieved April 7, 2014. ^ "Single seasons, playing for the STL, from 1921 to 1968, sorted by greatest triples". Baseball-Reference.com. Retrieved April 7, 2014. ^ "Single seasons, playing for the STL, from 1921 to 1968, sorted by greatest home runs". Baseball-Reference.com. Retrieved April 6, 2014. ^ "Single seasons, playing for the STL, from 1921 to 1968, sorted by greatest runs batted in". Baseball-Reference.com. Retrieved April 7, 2014. ^ "Single seasons, playing for the STL, from 1921 to 1968, sorted by greatest bases on balls". Baseball-Reference.com. Retrieved April 8, 2014. ^ "Single seasons, playing for the STL, from 1921 to 1968, sorted by greatest strikeouts". Baseball-Reference.com. Retrieved April 8, 2014. ^ "Single seasons, playing for the STL, from 1921 to 1968, sorted by greatest stolen bases". Baseball-Reference.com. Retrieved April 8, 2014. ^ "Single seasons, playing for the STL, from 1921 to 1968, (for this search only years since 1951 available), (requiring SB attempts ≥ 16), sorted by greatest SB %". Baseball-Reference.com. Retrieved April 9, 2014. ^ "Single seasons, playing for the STL, from 1921 to 1968, sorted by greatest runs created". Baseball-Reference.com. Retrieved April 9, 2014. ^ "Single seasons, playing for the STL, from 1921 to 1968, sorted by greatest extra-base hits". Baseball-Reference.com. Retrieved April 9, 2014. ^ "Single seasons, playing for the STL, from 1921 to 1968, sorted by greatest times on base with ROE". Baseball-Reference.com. Retrieved April 9, 2014. ^ "Single seasons, playing for the STL, from 1921 to 1968, sorted by greatest hit by pitch". Baseball-Reference.com. Retrieved April 10, 2014. ^ "Single seasons, playing for the STL, from 1921 to 1968, sorted by greatest sacrifice hits". Baseball-Reference.com. Retrieved April 10, 2014. ^ "Single seasons, playing for the STL, from 1921 to 1968, sorted by greatest sacrifice flies". Baseball-Reference.com. Retrieved April 10, 2014. ^ "Single seasons, playing for the STL, from 1921 to 1968, sorted by greatest double plays grounded into". Baseball-Reference.com. Retrieved April 11, 2014. ^ "Single seasons, playing for the STL, from 1921 to 1968, sorted by greatest intentional bases on balls". Baseball-Reference.com. Retrieved April 11, 2014. ^ "Single seasons, playing for the STL, from 1921 to 1968, (requiring at least 300 plate appearances), sorted by greatest AB per SO". Baseball-Reference.com. Retrieved April 11, 2014. ^ "Single seasons, playing for the STL, from 1921 to 1968, sorted by greatest outs". Baseball-Reference.com. Retrieved April 13, 2014. ^ "Single seasons, Playing for the STL, from 1969 to 2013, (requiring at least 300 plate appearances), sorted by greatest batting averages". Baseball-Reference.com. Retrieved December 30, 2013. ^ "Single seasons, Playing for the STL, from 1969 to 2013, (requiring at least 300 plate appearances), sorted by greatest on-base %". Baseball-Reference.com. Retrieved December 30, 2013. ^ "Single seasons, playing for the STL, from 1969 to 2013, (requiring at least 300 plate appearances), sorted by greatest slugging percentage". Baseball-Reference.com. Retrieved April 13, 2014. ^ "Single seasons, playing for the STL, from 1969 to 2013, (requiring at least 300 plate appearances), sorted by greatest on-base plus slugging". Baseball-Reference.com. Retrieved April 13, 2014. ^ "Single seasons, playing for the STL, from 1969 to 2013, (requiring at least 300 plate appearances), sorted by greatest adjusted OPS+". Baseball-Reference.com. Retrieved April 16, 2014. ^ "Single seasons, playing for the STL, from 1969 to 2013, sorted by greatest games played". Baseball-Reference.com. Retrieved April 16, 2014. ^ "Single seasons, playing for the STL, from 1969 to 2013, sorted by greatest plate appearances". Baseball-Reference.com. Retrieved April 18, 2014. ^ "Single seasons, playing for the STL, from 1969 to 2013, sorted by greatest at bats". Baseball-Reference.com. Retrieved April 18, 2014. ^ "Single seasons, playing for the STL, from 1969 to 2013, sorted by greatest runs scored". Baseball-Reference.com. Retrieved April 18, 2014. ^ "Single seasons, playing for the STL, from 1969 to 2013, sorted by greatest hits". Baseball-Reference.com. Retrieved April 18, 2014. ^ "Single seasons, playing for the STL, from 1969 to 2013, sorted by greatest total bases". Baseball-Reference.com. Retrieved April 18, 2014. ^ "Single seasons, playing for the STL, from 1969 to 2013, sorted by greatest doubles". Baseball-Reference.com. Retrieved April 18, 2014. ^ "Single seasons, playing for the STL, from 1969 to 2013, sorted by greatest triples". Baseball-Reference.com. Retrieved April 19, 2014. ^ "Single seasons, playing for the STL, from 1969 to 2013, sorted by greatest home runs". Baseball-Reference.com. Retrieved April 19, 2014. ^ "Single seasons, playing for the STL, from 1969 to 2013, sorted by greatest runs batted in". Baseball-Reference.com. Retrieved April 19, 2014. ^ "Single seasons, playing for the STL, from 1969 to 2013, sorted by greatest bases on balls". Baseball-Reference.com. Retrieved April 19, 2014. ^ "Single seasons, playing for the STL, from 1969 to 2013, sorted by greatest strikeouts". Baseball-Reference.com. Retrieved April 19, 2014. ^ "Single seasons, playing for the STL, from 1969 to 2013, sorted by greatest stolen bases". Baseball-Reference.com. Retrieved April 19, 2014. ^ "Single seasons, playing for the STL, from 1969 to 2013, (for this search only years since 1951 available), (requiring SB attempts ≥ 16), sorted by greatest SB %". Baseball-Reference.com. Retrieved April 19, 2014. ^ "Single seasons, playing for the STL, from 1969 to 2013, sorted by greatest runs created". Baseball-Reference.com. Retrieved April 19, 2014. ^ "Single seasons, playing for the STL, from 1969 to 2013, sorted by greatest extra-base hits". Baseball-Reference.com. Retrieved April 19, 2014. ^ "Single seasons, playing for the STL, from 1969 to 2013, sorted by greatest times on base with ROE". Baseball-Reference.com. Retrieved April 19, 2014. ^ "Single seasons, playing for the STL, from 1969 to 2014, sorted by greatest hit by pitch". Baseball-Reference.com. Retrieved March 18, 2015. ^ "Single seasons, playing for the STL, from 1969 to 2014, sorted by greatest sacrifice hits". Baseball-Reference.com. Retrieved March 18, 2015. ^ "Single seasons, playing for the STL, from 1969 to 2014, sorted by greatest sacrifice flies". Baseball-Reference.com. Retrieved March 18, 2015. ^ "Single seasons, playing for the STL, from 1969 to 2014, sorted by greatest double plays grounded into". Baseball-Reference.com. Retrieved March 18, 2015. ^ "Single seasons, playing for the STL, from 1969 to 2014, sorted by greatest intentional bases on balls". Baseball-Reference.com. Retrieved March 18, 2015. ^ "Single seasons, playing for the STL, from 1969 to 2014, sorted by greatest AB per SO". Baseball-Reference.com. Retrieved March 18, 2015. ^ "Single seasons, playing for the STL, from 1969 to 2014, sorted by greatest outs". Baseball-Reference.com. Retrieved March 18, 2015. ^ "Single seasons, playing for the STL, from 1969 to 2014, (requiring at least 100 innings pitched), sorted by smallest earned run average". Baseball-Reference.com. Retrieved March 30, 2015. ^ "Single seasons, playing for the STL, from 1969 to 2015, (requiring at least 100 innings pitched), sorted by greatest adjusted ERA+". Baseball-Reference.com. Retrieved December 20, 2015. ^ "Single seasons, playing for the STL, from 1969 to 2015, sorted by greatest wins". Baseball-Reference.com. Retrieved December 20, 2015. ^ "Single seasons, playing for the STL, from 1969 to 2015, sorted by greatest losses". Baseball-Reference.com. Retrieved December 20, 2015. ^ "Single seasons, playing for the STL, from 1969 to 2015, (requiring at least 10 decisions), sorted by greatest win-loss %". Baseball-Reference.com. Retrieved December 20, 2015. ^ "Single seasons, playing for the STL, from 1969 to 2015, sorted by greatest games played". Baseball-Reference.com. Retrieved December 20, 2015. ^ "Single seasons, playing for the STL, from 1969 to 2015, sorted by greatest innings pitched". Baseball-Reference.com. Retrieved December 20, 2015. ^ a b "From 1916 to 2013, Playing for STL, playing in NL, sorted by greatest HR". Baseball-Reference.com. Retrieved March 20, 2015. ^ "From 1916 to 2013, Playing for STL, as Starter, sorted by greatest game_score". Baseball-Reference.com. Retrieved January 19, 2014. ^ "From 1914 to 2014, playing for STL, playing in the NL, sorted by greatest IP". Baseball-Reference.com. Retrieved March 18, 2015. ^ Goold, Derrick (May 11, 2013). "Was Miller's gem the best ever for Cards pitcher?". St. Louis Post-Dispatch. ^ "From 1920 to 2014, playing for STL, playing in the NL, sorted by greatest SO". Baseball-Reference.com. Retrieved March 18, 2015. ^ a b "In the postseason from 1903 to 2014, playing for STL, playing in the NL, sorted by greatest SO". Baseball-Reference.com. Retrieved March 18, 2015. ^ a b c d e f g h i "Yadier Molina". Baseball-Reference.com. Retrieved October 14, 2014. ^ "St. Louis Cardinals leaderboards ›› catchers ›› fielding statistics, G". Fangraphs Baseball. Retrieved December 30, 2013. ^ "St. Louis Cardinals leaderboards ›› catchers›› fielding statistics, Innings". Fangraphs Baseball. Retrieved December 30, 2013. ^ "St. Louis Cardinals leaderboards ›› catchers ›› fielding statistics, Putouts". Fangraphs Baseball. Retrieved December 30, 2013. ^ "St. Louis Cardinals leaderboards ›› catchers ›› fielding statistics, Assists". Fangraphs Baseball. Retrieved December 30, 2013. ^ "St. Louis Cardinals leaderboards ›› catchers ›› fielding statistics, Double plays". Fangraphs Baseball. Retrieved December 30, 2013. ^ "St. Louis Cardinals leaderboards ›› catchers, ›› fielding statistics, Stolen bases". Fangraphs Baseball. Retrieved December 30, 2013. ^ "St. Louis Cardinals leaderboards ›› catchers ›› fielding statistics, Caught stealing". Fangraphs Baseball. Retrieved December 30, 2013. ^ "St. Louis Cardinals leaderboards ›› catchers ›› fielding statistics, Fielding percentage". Fangraphs Baseball. Retrieved December 30, 2013. ^ "St. Louis Cardinals leaderboards ›› catchers ›› fielding statistics, Errors". Fangraphs Baseball. Retrieved December 30, 2013. ^ "St. Louis Cardinals leaderboards ›› catchers ›› fielding statistics, Passed balls". Fangraphs Baseball. Retrieved December 30, 2013. ^ "St. Louis Cardinals leaderboards ›› catchers ›› fielding statistics, Wild pitches". Fangraphs Baseball. Retrieved December 30, 2013. ^ "St. Louis Cardinals leaderboards ›› first basemen ›› fielding statistics, G". Fangraphs Baseball. Retrieved January 18, 2014. ^ "St. Louis Cardinals leaderboards ›› first basemen ›› fielding statistics, Innings". Fangraphs Baseball. Retrieved January 18, 2014. ^ "St. Louis Cardinals leaderboards ›› first basemen ›› fielding statistics, Putouts". Fangraphs Baseball. Retrieved January 18, 2014. ^ "St. Louis Cardinals leaderboards ›› first basemen ›› fielding statistics, Assists". Fangraphs Baseball. Retrieved January 18, 2013. ^ "St. Louis Cardinals leaderboards ›› first basemen ›› fielding statistics, Double plays". Fangraphs Baseball. Retrieved January 18, 2013. ^ "St. Louis Cardinals leaderboards ›› first basemen ›› fielding statistics, Fielding percentage". Fangraphs Baseball. Retrieved January 18, 2013. ^ "St. Louis Cardinals leaderboards ›› first basemen ›› fielding statistics, Errors". Fangraphs Baseball. Retrieved January 18, 2013. ^ "St. Louis Cardinals leaderboards ›› second basemen ›› fielding statistics, G". Fangraphs Baseball. Retrieved January 29, 2014. ^ "St. Louis Cardinals leaderboards ›› second basemen ›› fielding statistics, Innings". Fangraphs Baseball. Retrieved January 29, 2014. ^ "St. Louis Cardinals leaderboards ›› second basemen ›› fielding statistics, Putouts". Fangraphs Baseball. Retrieved January 29, 2014. ^ "St. Louis Cardinals leaderboards ›› second basemen ›› fielding statistics, Assists". Fangraphs Baseball. Retrieved January 29, 2014. ^ "St. Louis Cardinals leaderboards ›› second basemen ›› fielding statistics, Double plays". Fangraphs Baseball. Retrieved January 29, 2014. ^ "St. Louis Cardinals leaderboards ›› second basemen ›› fielding statistics, Fielding percentage". Fangraphs Baseball. Retrieved January 29, 2014. ^ "St. Louis Cardinals leaderboards ›› second basemen ›› fielding statistics, Errors". Fangraphs Baseball. Retrieved January 29, 2014. ^ "St. Louis Cardinals leaderboards ›› third basemen ›› fielding statistics, G". Fangraphs Baseball. Retrieved February 2, 2014. ^ "St. Louis Cardinals leaderboards ›› third basemen ›› fielding statistics, Innings". Fangraphs Baseball. Retrieved February 2, 2014. ^ "St. Louis Cardinals leaderboards ›› third basemen ›› fielding statistics, Putouts". Fangraphs Baseball. Retrieved February 2, 2014. ^ "St. Louis Cardinals leaderboards ›› third basemen ›› fielding statistics, Assists". Fangraphs Baseball. Retrieved February 8, 2014. ^ "St. Louis Cardinals leaderboards ›› third basemen ›› fielding statistics, Double plays". Fangraphs Baseball. Retrieved February 8, 2014. ^ "St. Louis Cardinals leaderboards ›› third basemen ›› fielding statistics, Fielding percentage". Fangraphs Baseball. Retrieved February 8, 2014. ^ "St. Louis Cardinals leaderboards ›› third basemen ›› fielding statistics, Errors". Fangraphs Baseball. Retrieved February 8, 2014. ^ "St. Louis Cardinals leaderboards ›› shortstops ›› fielding statistics, G". Fangraphs Baseball. Retrieved February 8, 2014. ^ "St. Louis Cardinals leaderboards ›› shortstops ›› fielding statistics, Innings". Fangraphs Baseball. Retrieved February 8, 2014. ^ "St. Louis Cardinals leaderboards ›› shortstops ›› fielding statistics, Putouts". Fangraphs Baseball. Retrieved February 8, 2014. ^ "St. Louis Cardinals leaderboards ›› shortstops ›› fielding statistics, Assists". Fangraphs Baseball. Retrieved February 8, 2014. ^ "St. Louis Cardinals leaderboards ›› shortstops ›› fielding statistics, Double plays". Fangraphs Baseball. Retrieved February 8, 2014. ^ "St. Louis Cardinals leaderboards ›› shortstops ›› fielding statistics, Fielding percentage". Fangraphs Baseball. Retrieved February 8, 2014. ^ "St. Louis Cardinals leaderboards ›› shortstops ›› fielding statistics, Errors". Fangraphs Baseball. Retrieved February 8, 2014. ^ a b c "St. Louis Cardinals leaderboards ›› outfielders ›› fielding statistics, G". Fangraphs Baseball. Retrieved March 18, 2015. ^ a b c "St. Louis Cardinals leaderboards ›› outfielders ›› fielding statistics, Innings". Fangraphs Baseball. Retrieved March 18, 2015. ^ a b c "St. Louis Cardinals leaderboards ›› outfielders ›› fielding statistics, Putouts". Fangraphs Baseball. Retrieved February 12, 2014. ^ a b c "St. Louis Cardinals leaderboards ›› outfielders ›› fielding statistics, Putouts". Fangraphs Baseball. Retrieved February 13, 2014. ^ a b c "St. Louis Cardinals leaderboards ›› outfielders ›› fielding statistics, Double plays". Fangraphs Baseball. Retrieved February 13, 2014. ^ a b c "St. Louis Cardinals leaderboards ›› outfielders ›› fielding statistics, Fielding percentage". Fangraphs Baseball. Retrieved March 18, 2015. ^ a b c "St. Louis Cardinals leaderboards ›› outfielders ›› fielding statistics, Errors". Fangraphs Baseball. Retrieved February 13, 2014. ^ "St. Louis Cardinals leaderboards ›› pitchers ›› fielding statistics, Putouts". Fangraphs Baseball. Retrieved March 18, 2015. ^ "St. Louis Cardinals leaderboards ›› pitchers ›› fielding statistics, Assists". Fangraphs Baseball. Retrieved February 12, 2014. ^ "St. Louis Cardinals leaderboards ›› pitchers ›› fielding statistics, Double plays". Fangraphs Baseball. Retrieved February 13, 2014. ^ "St. Louis Cardinals leaderboards ›› pitchers ›› fielding statistics, Fielding percentage". Fangraphs Baseball. Retrieved February 13, 2014. ^ "St. Louis Cardinals leaderboards ›› pitchers ›› fielding statistics, Errors". Fangraphs Baseball. Retrieved February 13, 2014.